Traditional and tough, these baskets are a mainstay in many an office. Will not burn, melt or emit toxic fumes. Powder coated for durability. Raised bottom prevents heat transfer to floors in case of fire. Vinyl rim cushion and nylon glides protect furniture, walls, floors and carpeting. Meets federal specification A-A-182 for fire hazard and flammability prevention. 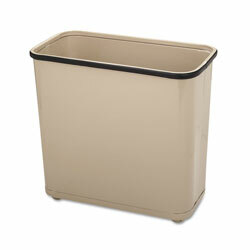 Dimensions: Height 15" - Width 17" - Depth 8"
7.5 Gallons Beige Fireproof Trash Cans from Rubbermaid! 51 In Stock today.